I got my inspiration for this project from Daily Drop Cap. The designer Jessica Hirsche posts one letter of the alphabet each day, highly decorated drop caps like a modernized version of the gilded initial caps in very old books. Many of the decorations come in the shapes of vines, leaves, and swirls, so when I read that the purpose of this assignment was to simulate nature, I wondered if it would be possible to simulate a vine effect algorithmically, and mimic the way Jessica Hirsche does some of her drop caps by hand. There would be more limitations, of course. For example, from the very start I decided I would not deal with color — that added dimension would overcomplicate the project far too much. The basic idea was fairly straightforward: given a letter, grow vines or swirls out of its edges. The reality turned out to be much more complicated, and I’m ashamed to say that this project was rather a failure. It took me a VERY long time just to find a way to get the points on the outside of a letter — and even now it isn’t perfect, since it will also give you points from the counterform of the letter (such as the hole inside of an ‘O’). I’ve gotten around this for most letters by cheating and only grabbing the first 2/3 of the points (since the outer edge generally comes before any inner edges) and then choosing a set of starting points from there. However, this is optimized for letters like the ‘A’ below and doesn’t necessarily yield good results for, say, the letter ‘N’. I had planned to go for a much more swirling, viney look, but I had trouble procedurally generating the vines and producing nice curves. I ended up adapting a version of the Processing tree with Bezier curves instead of straight lines. It wasn’t exactly the look I had been trying to achieve, but it produced the best results with the least overlap and interference between vines. As shown above, the user is given several input options; namely, you can choose the letter, a font, and then play with a few sliders that will affect the output of the vines/swirls, such as the density, the thickness of the lines, and the size of the leaves at the end of the vines. I had ideas for other user input options (such as symmetry vs. randomness of the output) but did not have time to implement them. Initially, my plan was to generate the output in such a way so that the resulting decorated letterform could then be lasercut and turned into a stamp. Obviously, I gave up on this idea, as there just wasn’t enough time to pursue it. All in all, this has been a very frustrating and exhausting project, and I wish I’d known what I was getting myself into when I first conceived it. I’m glad I tried, but I do think it was too ambitious for a project of this length. As Patrick suggested, though, I may continue this for my final project and flesh it out a lot more. Hi Nara, here are the class’s comments from the crit. 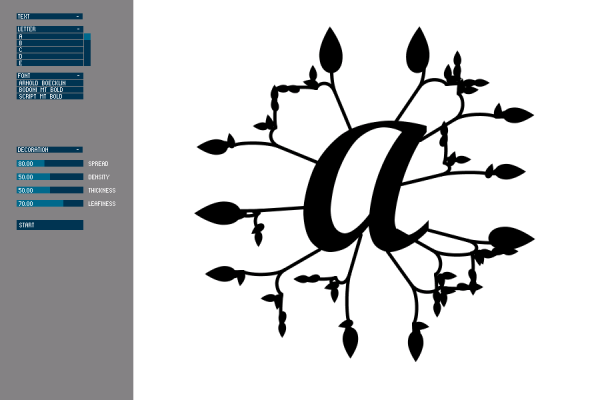 OpenFrameworks connects to an OpenType library that provides type outline points. Seems to need more local intelligence about the letterform, if not an actual growth algorithm.